Boaters, start your engines! 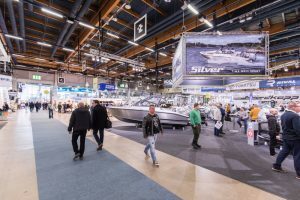 The Orlando Boat Show sails into the Orange County Convention Center’s West Hall on Friday, March 8. Central Florida’s premier boat show lasts three days and features more than 400 boats, live presentations, interactive games, and the chance to win a NauticStar 215 XTS boat—worth $30,000! The event hall is open from 10 a.m. to 8 p.m. on Friday and Saturday, and 10 a.m. to 5 p.m. on Sunday, March 10. Admission starts at $9 for adults. However, early bird tickets discounted to $7 are available online beginning February 1, 2019. The event offers free admission for kids 12 years of age and under. Charter professionals such as Captain Jim Ross and Captain Kerry Kline will be on hand to host informative seminars on the latest in boating and fishing tips. Guests can learn about secret fishing spots and get the inside scoop on where to go and what to do on the lakes and rivers of Central Florida. Each of the captains will also be giving away prizes to lucky winners such as a half-day fishing experience and a 1-year Sea Tow membership. Central Florida’s best dealers will be in attendance exhibiting the top boats from over 70 manufacturers. Straight from the viral video, the submersible Seabreacher recreational boat — capable of 360-degree barrel rolls on the water — will be on display for guests to get an up-close view. The event offers fun activities for adults, families, and children of every age. Attendees can experience the excitement of catching a bull dolphin in a competitive virtual saltwater fishing simulator as they race their opponent to see who can boat the fish first. Children attending the show can catch a live trout in a safe and fun catch-and-release activity. For convenient access to the Orlando Boat Show, reserve your stay at the Rosen Inn. Located on International Drive, the Rosen Inn offers affordable luxury amid all of the action in Orlando. Secure your room by calling us today at (407) 996-4444.